1. In a small frying pan, toast the peppercorns until fragrant. Allow to cool then crush them in a pestle and mortar. Add the cashews and grind until you have a breadcrumb consistency. 2. 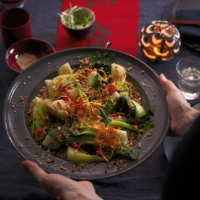 Line a large steamer with baking parchment, lay the pak choi on top and steam over boiling water for 5 minutes until tender. 3. Heat a wok or frying pan until smoking hot, then add the oil, garlic, ginger and chillies and cook until golden and crisp. 4. Remove the pak choi from the steamer and place on a serving dish. Pour over the crispy garlic, ginger and chilli then scatter with the ground salt-and-pepper nuts. Serve immediately. More info: 2.3g protein, 0.9g fibre.